The Gears of War 3 cast just got a little sexier, says Cliff Bleszinski. 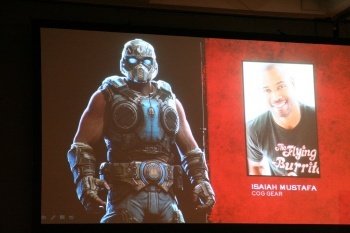 Isaiah Mustafa, better known as "Old Spice Guy," has something new to add to his resume alongside selling manly hygiene products or being the Marvel superhero Luke Cage: fighting against the villainous Locusts as a COG Gear in a Gears of War 3. "The cast just keeps getting sexier and sexier," joked Epic's design director Cliff Bleszinski as he revealed the news at the San Diego Comic Con. Mustafa joins the likes of John DiMaggio, Ice T, and Claudia Black. His character is listed as "COG Gear," which makes it sound like he's not going to have a particularly big role in the game. It doesn't help that he's wearing a helmet, which in Gears universe is like painting a target on your back or putting on a red Starfleet uniform. Still, he's got a great voice, and I wouldn't be at all surprised to see a nod to the Old Spice commercials tucked in there somewhere as an Easter Egg. According to Bleszinski and executive Rod Ferguson, Gears 3 is the series' biggest campaign ever, with four player co-op throughout, and a more personal story, where the player learns more about Marcus and his relationship with his father, as well has how the war with the Locust ends. The online elements have also received some tweaks, including a deeper Horde mode, and a "reverse VIP" area, which lets people with no Gears experience get a feel for the game without having to worry about being squashed by veterans.